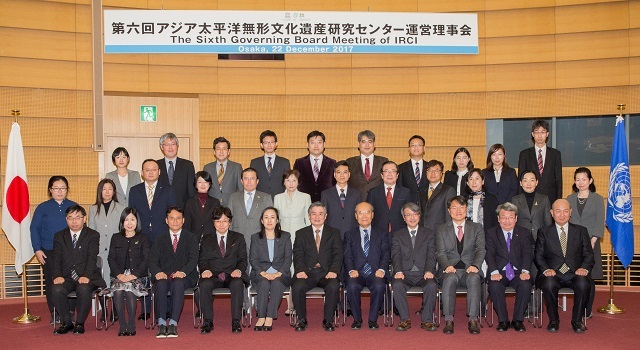 The Sixth Governing Board Meeting of IRCI was held on 22 December 2017 at the Osaka International Convention Center. In addition to the 8 members of the governing board, 18 participants such as Mr. Koïchiro Matsuura, Former Director General of UNESCO and the Honorary Advisor of IRCI, representatives of the Ministry of Foreign Affairs, Agency of Cultural Affairs, Sakai City, other UNESCO C2 centres of intangible cultural heritage in China (CRIHAP) and Republic of Korea (ICHCAP) attended the meeting. The following day, a cultural excursion to experience Japanese Tea Ceremony was organised. The foreign participants were fascinated by the charm of the tradition of Tea Ceremony through cultural experiences including the introduction of the way of taking the sweet and the tea, lectures regarding the manners and the reasons why those manners are highly respected and so on. It was a great opportunity to introduce the piece of excellent Japanese traditional culture.